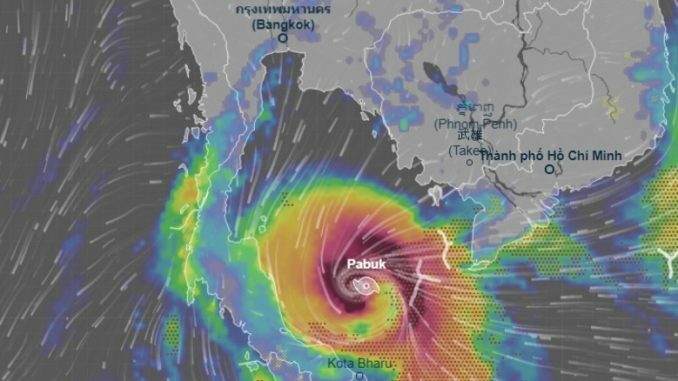 Tropical Storm Pabuk is moving west-northwest at a speed of 25 km/hr and will affect southern Thailand, where heavy rains are expected, by January 4-5. According to blogger Richard Barrow, flights are landing and taking off as normal this morning (January 4) at Phuket, Chumphon and Ranong airports where no rain is reported, but Nakhon Si Thammarat and Samui airports are closed today. Although Pattaya and Hua Hin are not expected to be heavily hit by the storm, the ferry service between Pattaya and Hua Hin has been temporarily suspended.